Thank you Dragon Quest, for reminding me of things I often forget. Over the past month, I've been playing Dragon Quest XI. But my time with it has been heavily fractured. Between my time with it, I've also played Spider-Man, Forza Horizon 4, Destiny 2: Forsaken, The Gardens Between, and probably a bunch of other games I'm forgetting about too. My time is divided among too many games, but there's a feature in Dragon Quest XI that makes me returning to it all the easier. The recap. 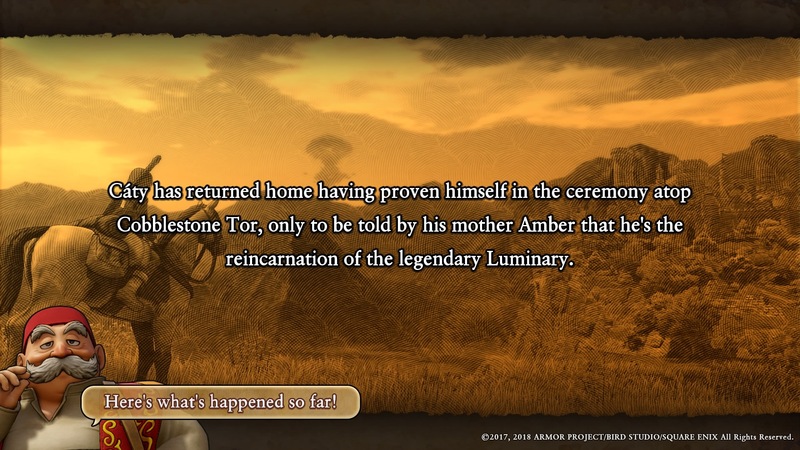 Every time you boot up Dragon Quest XI, you're treated to a sweet little recap on what happened the last time you played. Even if you stopped and paused for five minutes before quitting, you still get a new recap, with just a few different details around. The recap is seemingly generated according to how far along you are, and how much you played in each session. The recap is detailed accordingly, not punctuated by simple "hey, you did this last time" notices, but by actual storytelling. A very early example from the start of Dragon Quest XI, to keep this spoiler free. Also yes, the accent in my name makes no sense. I regret it already. This is my first Dragon Quest game, and it's a feature that feels really novel; especially when so much of the discourse floating around this week is about Assassin's Creed Odyssey and whether games should be hella long or not. For RPGs, a genre that's always had a habit for being an intimidating time sink, the introduction of a somewhat-generated recap seems like a no-brainer addition—something I'm shocked I've never come across before in a video game aside from episodic games and the light recaps in The Witcher 3. After all, the average adult is too busy to dedicate a lot of time to games. Our weekends are full of social activities, errands, calling our parents, binging the latest Netflix show, and so on. For me, it's full of dozens of other games at once, and yeah, the occasional Netflix show. Sometimes games we start slip by, and it can be days (or even weeks) until we return to it—if we return at all. That's the key to Dragon Quest XI's recap feature: whether you haven't played in a day or in weeks, the opening recap is always there to jog your memory. Dragon Quest XI only has the former, but its combat is relatively uncomplicated, so it's not necessary. Storywise though is where it gets more dense, coupling light side quests with heavy character development, making the refresher always warmly welcoming. It may not pick up on the long time I spent loitering in houses, watching NPCs do mundane things like cook sausages, but it will remind me of how I explored the town at leisure. Maybe it'll even contain a snippet of information about a side quest I did or something, like saving a cat from a roof. I imagine behind Dragon Quest XI's recaps, there's some magical algorithm stitching everything together, and accounting for how much I played from my last section, what I did, what I dwelled on, who I talked to. One recap might be a dense story dump, while another might be simpler, detailing some other aspect of my journey in more intricate detail. It's that level of structure and variety that's consistently surprised me every time I boot up Dragon Quest XI. 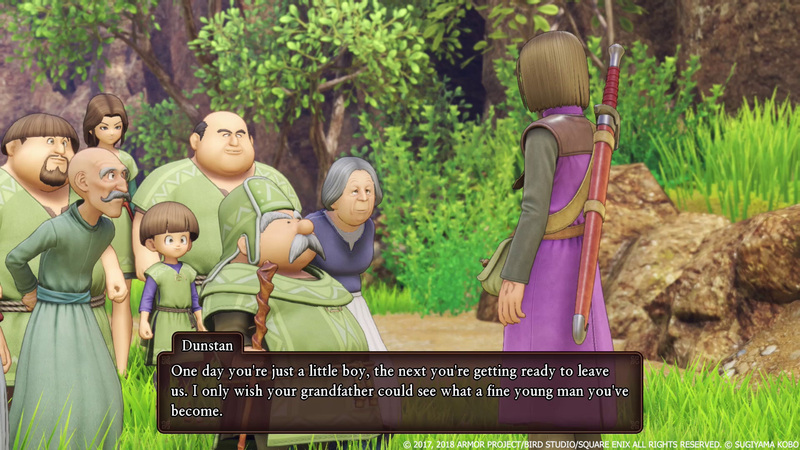 For Dragon Quest XI, everything is a story; and everything deserves to be remembered too. Dragon Quest XI is engineered to be the most pleasant game imaginable, to take the burden off the player and just give you a nice time with an intricately designed and written world. The recap feature is just another facet of that, and I hope it catches on with other games. Something tells me it won't, though, and I can expect to continue reteaching myself the goings-on for more long games. This only makes Dragon Quest XI a more desirable game to keep coming back to over the months though. I predict I'll be casually playing it in-between other games during the busy fall game season, enjoying my time with Sylvando and friends well into the winter season. And maybe even beyond. Tagged with Opinions,	PC,	PlayStation 4,	Role Playing Games,	Square Enix.